Today I’d like to highlight some interesting feeding tools, automatic feeders, live food dispensers and other products designed for herp and invertebrate keepers. Included are items that can lighten our work load, ensure safety when feeding aggressive creatures, and automatically provide meals in our absence. I especially favor products that dispense live insects at irregular intervals, and also those which force turtles, newts and aquatic frogs to work for their food. This concept, known as behavioral enrichment, became standard zoo-practice while I was working at the Bronx Zoo. In addition to encouraging exercise, such devices add greatly to the range of interesting behaviors we can observe among our pets. 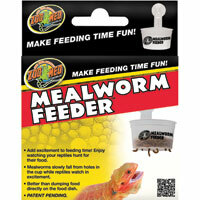 The perforated bottom of Zoo Med’s Hanging Mealworm Feeder allows grubs to find their own way into the terrarium. Mealworms that escape detection will encourage natural hunting behaviors. Animals of all kinds quickly learn to recognize the feeder…if you remove it when not in use most, will respond right away when it is returned. I’ve employed similar feeders in zoos for a wide range of creatures. Zoo Med’s modal should also be useful to those who keep oscars and similar fishes, hedgehogs, sugar gliders, finches, shama thrushes, and other insectivorous pets. The first worm feeders were designed to provide tubifex worms to tropical fishes. I still use the same modal I first purchased as a child…and the price hasn’t gone up much! In addition to being a great fish-feeding tool, Lee’s Four-Way Worm Feeder is perfect for offering blackworms to newts, axolotls, African clawed frogs and small turtles. Available in 3 sizes, Exo Terra’s Cricket Pen takes much of the hassle out of keeping those pesky but ever-present crickets. Detachable dispensing tubes, which are used as sheltering sites by crickets, are set into a ventilated, plastic cage. 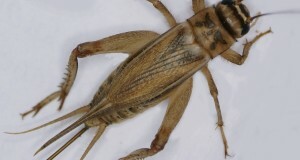 A flap seals the tubes lower end when it is removed, allowing crickets to be added to terrariums with a tap of the finger. 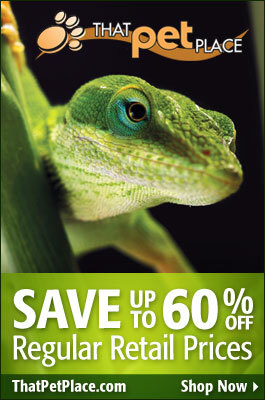 Cricket food and water receptacles are also included. Depending upon the species and terrarium set-up, you may also be able to simply place the Cricket Pen into your pet’s tank and let the crickets escape on their own. Covering the pen with dark paper will keep animals from trying to reach crickets through the plastic walls…you should notice an increase in alertness and foraging behavior if you use it in this way. Gone are the days when we had to modify tweezers and cooking utensils for use as herp-feeding tools. Zoo Med’s 10-inch Stainless Steel Feeding Tongs is perfect for presenting meals to snakes, scorpions, mantids, and tarantulas, and for removing debris from tanks where one’s fingers are best kept out of reach. As most frogs seem to lack any sort of reasonable control over their feeding lunges, I use Zoo Med’s Plastic Feeding Tongs when feeding mine (this tendency is not limited to pets – I’ve seen wild American Bullfrogs crash into rocks, and one landed so close to a larger frog that it too wound up as a meal!). 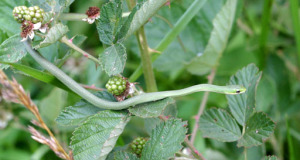 Lizards vary in their feeding responses…over-zealous feeders may injure themselves on metal tongs, while others are not at risk. You might want to stay with plastic tongs for certain snakes also. Feeding tongs can also be used with various fishes and birds…or, if you’ve been as lucky as I. with captive short-tailed shrews and least weasels (two of the most insanely-ferocious creatures I’ve worked with!). 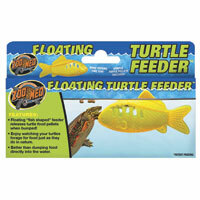 The Zoo Med Floating Turtle Feeder is the best behavioral enrichment -type turtle product on the market. Amazingly simple in design and easy to use, it will keep sliders, musk turtles, map turtles and similar species well-occupied…and their owners very amused! Exo-Terra’s Automatic Turtle Feeder, similar in design to automatic fish-feeders, is a much-needed addition to the turtle-keeper’s supply kit. 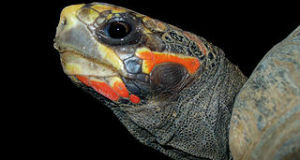 You can read more about these useful turtle-feeders in this article. I encountered a problem today with my leopard gecko. I was feeding him crickets as usual, when he got over excited and grabbed one from the tweezers before I even had a chance to put it on the ground. Normally I am able to angle the point downwards and when he grabs the prey he doesn’t poke himself, however this time I felt the tweezer point scrape the inside of his jaw. I couldn’t see any blood, he didn’t act weird and actually ate several more crickets after that. I’ve been watching him all morning and he’s now sleeping in his warm hide. No swelling that I can see but I will keep an eye on it. This has made me a worried gecko momma and I’m now in search of a safer, rounded feeding tong. I found some that had some soft rubber cap looking things on the ends but I found them on a website from a different country. All the tongs I found online do not mention rounded tips, nor do they look rounded in the pictures. Should I go with plastic even if they are not rounded or is there a brand that is better than others? I just don’t want him to hurt himself. Thank you in advance for your response!